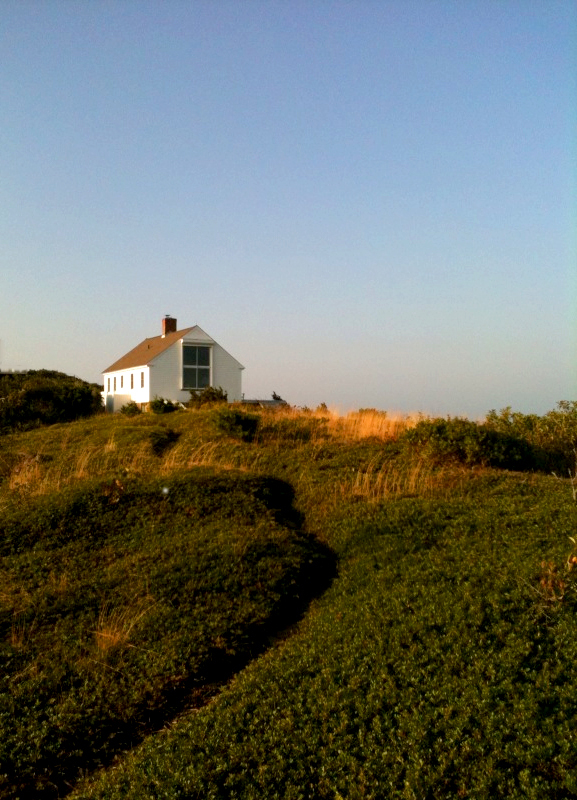 I wrote a letter to a friend today about the trip I'll be taking later this Fall to stay and work once again in Edward Hopper's old painting studio on Cape Cod (this will be my 14th residency there). As often happens when I get going about Hopper the letter went on a bit longer than I'd intended. Hopper is unique for an American realist painter as he seems to speak to so many different kinds of people, including very much to me. I've studied his work, his studio and his birthplace at some length and have learned much about how he worked and what he looked for when he painted. Some of these I've written about frequently on this blog, other ideas less so. So I decided to post most of the letter as I think many would find it of interest. It was seeing Hopper's work that inspired me to change from painting abstractions to setting out in a realist direction back in the late '60's. As I was an inexperienced art student in a small avant garde art department at Oberlin College this seemed like a lonely path indeed. Some of my art professors at the time were horrified. But in Hopper's example I was given the courage to break from the pack (at the college in those days it was just expected that if you were going to paint you were going to imitate Frank Stella or Mark Rothko. I did at first, and I learned much). But then Hopper came along and tapped me on the shoulder. One striking evolution in Hopper's work is how much his early paintings (think of the lovely oils he did during his stays in Paris) reflected the influence of his charismatic teacher Robert Henri. Hopper himself complained it took him ten years to "get over" his Henri influence. That story had a real impact on me. One of the chief lessons I learned from Hopper is to use what you learn from the masters of the past to help you go out and tell your own unique story. In my landscape paintings of the last twenty years I think I've been very successful at this. Yes, the George Billis Gallery show is still set for Dec. 11- Jan. 19, 2013. I have been painting interior views of the Hopper studio on and off over the 30 years I've been visiting place in South Truro. They have been a wonderful complement to my usual landscape painting. And they are my way of remembering the lessons Hopper taught me through his work. 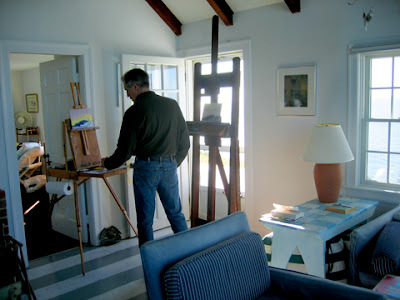 Here's a photo of me working in Hopper's painting room (that's Hopper's easel at the right). 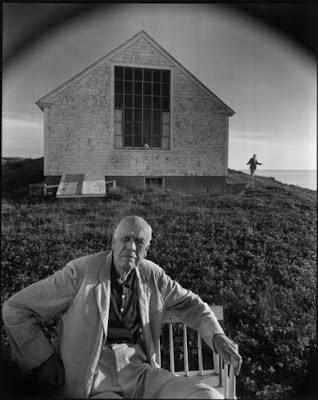 I'm standing in between the two doorways that inspired his wonderful Rooms by the Sea oil (2nd photo) now in Yale's Collection. And here below is a new version I started last week of one of my older oils. It shows how the studio is actually laid out. he has the sunlight shining on a wall it never hits in reality. The view is looking south, and the empty wall faces due north. lending the painting a delicious slightly surreal quality. I used to wonder about this lovely but odd placement before I ever had visited the studio. 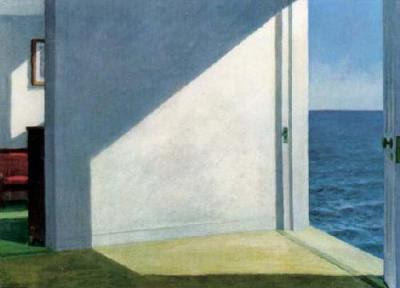 But I found that when one sits in a chair at the far end of the studio away from the water (which is where Hopper usually placed his easel when he worked) that his viewpoint was low enough to the ground he would have seen the doorway seeming to lead directly out into the water. So the oddness of the painting's composition actually stemmed from Hopper responding to something he actually saw. He just had the sense to take advantage of it. Here's a photo I took of the studio in Oct. of '10 showing another crucial aspect of the building. Hopper designed the studio down to the last nail, even constructing a detailed cardboard scale model to show the builder. seen anything quite like it. 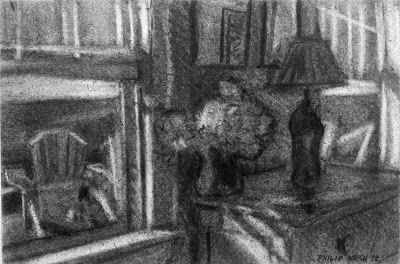 there to do some more paintings of that light filled interior. did Hopper even fit in this room?" the bureau and the end of Hopper's bed (I felt I was eating my knees as I drew). You look over the sweeping undulations of three enormous sand dunes down to Cape Cod Bay. In the distance an emerald blue/green sliver of distant Provincetown shoots out into the sea. It's a view that is stunningly beautiful, but Hopper attempted only one watercolor of it that he never finished. While it was a view that was convenient and lovely, it simply wasn't good enough for Hopper. He wanted something more off the beaten track. Hopper was famous for his meandering drives around the Cape's backroads and for taking long solitary walks through its landscape. He was out "hunting" for new ideas he could make use of to create his surprising and sometimes even unorthodox compositions. More than anything, Hopper's great lesson to me is no to settle for the ordinary way of presenting things. To him being alive was a remarkable thing and he was determined express its "beyond the ordinary" feeling. His ruthless commitment to find unexpectedways to look at the world deeply impressed me. He didn't have time to paint the delightful view out his north window- a view that dozens of other less remarkable landscape painters would have been happy to work from. road. What resulted was one of the most unusual as well as most one of the most evocative landscape paintings in American art history. Well I am glad you went on longer than you intended. 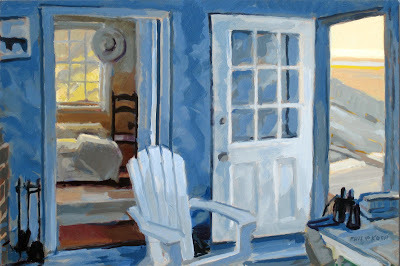 Your presence in Hopper's studio and your feelings and reflections about that experience are mesmerizing. Loved reading this blog post. Great reading. 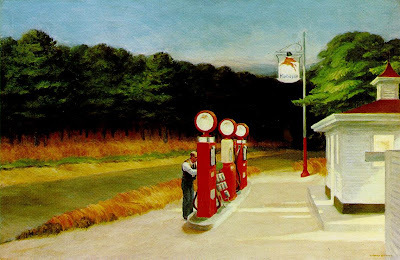 I am currently teaching Kidzart in Mississippi and am covering Edward Hopper with my 3rd graders. I like to study up on each artist that we cover. We have a new one every two weeks or so. I found your blog through one of the websites about Hopper. You had commented on it and mentioned your blog. So here I am. Thank you Mr. Koch.